Did you know that 150 years ago, the Charles River ran through what is now Back Bay? Or that you can still see bald eagles on the Esplanade? If not, come learn about the history, wildlife, trees, and gardens of Boston’s premier riverside park. 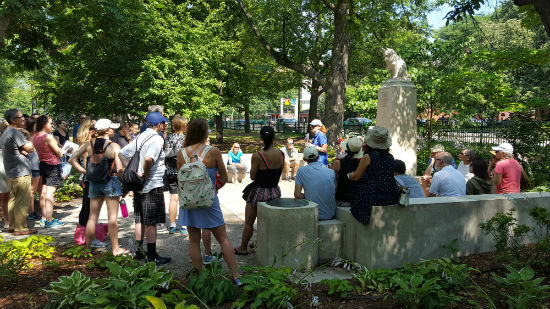 From February through December, the Esplanade Association is excited to offer free guided walking tours on the Esplanade to share the park’s amazing stories, plants, and wildlife. Guided walking tours will last about an hour-and-a-half and cover roughly a mile of the Esplanade and over 150 years of history! Additional history tours can also be scheduled for a nominal donation. If you would like to schedule a private tour, please email Micah Jasny, Volunteer & Programs Manager, at mjasny@esplanade.org. All tours meet at Community Boating Inc., 21 David G Mugar Way, Boston, MA 02114. If you have any questions please email Micah Jasny at mjasny@esplanade.org.